Gray, Ali Kearney, Micheal McBride, Niall McLarnon, Aaron Kelly, Aidan McLarnon and Oisin Fay. qualified in 2nd place to reach the semi finals. in Greystones Tennis Club, on the 16th of May. Everybody played well but unfortunately we lost 2/1. We are already looking forward to next years tournament. We say thank to Maura Keating for entering us in the tournament and for all the work she did. 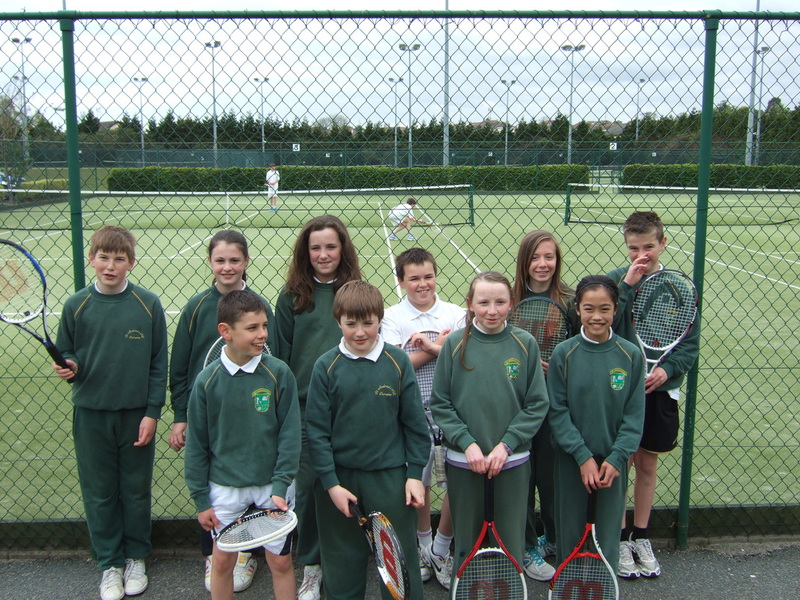 In mid-April St. Andrews entered the Leinster Schools Tennis competition with a girls team and a mixed team. I was part of the girl’s only team. The squad was made up of the following: Laoise Nolan, Sarah McLoughlin, Hannah Keogh, Jane Roche, Anna-May and Freya Daughton, Amy McDermott and Ali Kearney. We were quite nervous for our first match against Sandymount because we had never played a competitive match before. We needn’t have been so worried because we won all three matches. After that match we were not so nervous and enjoyed the rest of them very much. We were unable to get three wins again but always came home with at least one win. The first pair to win nine games win the match, each time you win a match it counts as one point. We played against teams that had previous experience in the competition such as Rathgar and Malahide. All of the girls were really nice and everyone played brilliantly. We did fantastically by coming third as it was our first time in the competition. We hope to do our school proud again next year and finish in the top two and reach the play offs. Paud O'Donoghue was born around 1760. He was a blacksmith and he made weapons for the rebels but there was a traitor in the group. The captain of the Yeoman and a troop rushed out one evening from the woods of Kilbrew. Paud O'Donoghue was soon a prisoner. The captain was going to kill Paud but then he realised that his horse needed a new shoe so as Paud was a blacksmith he asked him to make it for him. Paud made the shoe and fitted it on the horse and when he was finished he hit the captain on the head with his hammer and rode away on the horse into Kilbrew woods. This is a verse of a poem by Patrick Archer. Young Paud he was as brave a boy as ever hammer swung the finest hurdler that you'd find in the lads of Meath among and when the wrestling match was o'er no man could boast he threw the black haired smith of Curragha young Paud O,Donoghue. That is my favourite verse.The United Irishmen rebellion started in 1798 and Paud participated in the rebellion. The rebellion lasted several months against British rule in Ireland .The date was about 24 May - 23 September. There were 50,000 United Irish fighters, 40,000 militia, 1,000 French regulars, marines and sailors, 3,000 British regulars and 25,000 Yeomanry. There were 10,000 estimated Irish deaths and over 1,000 loyalist deaths. Paud O'Donoghue had a friend called Henry Grattan who died in the rebellion- they executed him. The statue of Paud O’Donoghue in Curragha was sponsored by Perri Crisps. Raymond Coyle is related to Paud O'Donoghue on his mothers side. When Paud galloped off on a horse into Kilbrew Woods no one knows where he went- did he make it to the other side or did he get captured? Out of all the stuff I did for the project I like the way we all went down to the statue to do research. I loved this project.